Purim is the most festive of Jewish holidays, a time of prizes, noisemakers, costumes and treats. The Festival of Purim commemorates a major victory over oppression and is recounted in the Megillah, the scroll of the story of Esther. Purim takes place on the fourteenth and fifteenth days of Adar, the twelfth month of the Jewish calendar. This year (2004), Purim begins at sundown on Saturday the 6th of March. Some of the nicest traditions of Purim are matanot laevyonim, the giving of gifts to the poor, and mishloach manot, the giving of gifts of food to friends and family. Purim is known as a time of delicious smells emanating from the kitchen from the baking of the delicious sweets and goodies. The traditional Ashkenazi dessert for Purim is hamantashen, a triangular cookie usually filled with poppy seed (mohn) or prune filling. According to different theories, the triangular shape of the hamantashen or "Haman's pockets" is supposed to represent Haman's pockets filled with lots, his tri-cornered hat, or his ears. The shape may also represent the three Patriarchs, Abraham, Isaac and Jacob, who inspired Queen Esther. The most traditional filling is poppy seed (or "mohn" in Yiddish), perhaps because the Yiddish word is so close to "Homen" (Yiddish for Haman). Most people prefer not to make their own fillings, but homemade filling is easier to tailor the sugar to the fruit used. The recipe below gives you both options for the filling; store-bought or homemade. 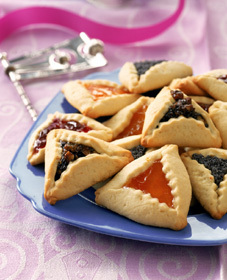 Serve hamantaschen on: Purim, Yom ha-Atzma'ut or Shabbat. Hamantaschen may be eaten at Dairy or Pareve* (see note) meals. *Note: Use vegetable shortening in place of butter for Pareve meals. 1. Preheat the oven to 375 degrees F (190 C), with shelves in the middle and lower third of the oven. Line 2 cookie sheets with parchment paper. 2. Place the all-purpose flour, cake flour, baking powder, salt, and sugar in a food processor bowl. Process just to mix ingredients together. 3. Cut the butter into 1/2-inch chunks and place on top of the flour. Pulse-process until the butter is cut into the flour so that the mixture looks like coarse meal. 4. In a bowl, lightly whisk together the vanilla extract, orange juice, and egg. With the processor running, add the egg mixture through the feed tube. Pulse-process for 10 seconds, 3 times. Dump the dough out onto a board. You should be able to press it into a ball that is neither sticky nor dry. When you shape the dough you will know if it is the right consistency: it will not be too sticky to roll, and the dough will not crack when you fold up the edges to make the triangles. If the dough is not right after shaping the first cookie, it can be put back in the processor and a little more water or flour added. If necessary, add up to 2 tablespoons more cake flour, a little at a time, to make the dough the proper consistency (those who are weighing the flour should use 240 grams, which makes the perfect consistency). 5. Because this dough has so much sugar in it, it gets stickier as it sits. It is best to use it at once, and to work quickly. 6. Divide the dough into 2 pieces. Flatten each piece, and roll it to a scant 1/8-inch thick. Cut into 2 1/2-inch rounds. Gather the scraps, re-roll and cut. Place 1 rounded teaspoon of filling, almost centered, just slightly closer to the top edge than the bottom edge. Fold the edges towards the center to form a triangle, leaving a bit of filling showing. Pinch the edges to seal. 7. Place the cookies 1/2-inch apart on the cookie sheets. Put one cookie sheet on each rack. Bake 6 minutes, switch the position of the top and bottom cookie sheets, and continue to bake for 5 to 6 minutes or until cookies are firm, but not browning. Cool completely before eating. 1. Soak the poppy seeds in the boiling water until cool, or overnight. 2. Grind the seeds in a coffee or spice grinder, as finely as possible. A mortar and pestle can also be used. 3. Combine the seeds, water, honey, lemon juice and cinnamon in a small pot and cook over medium heat until the filling is thick, stirring frequently. 4. Remove from heat, cool, and then stir in the egg. Refrigerate until ready to use. Makes enough filling for 26 small hamantaschen. It was very very good. The filling could have been made a bit better. This recipe was so great! My Hammantaschen came out fantastic and beautiful. The dough was pretty dry so I used 2 tablespoons of orange juice total and instead of just vanilla I used 1/2 tsp. vanilla and 1/2 tsp. almond extract. Thanks for the recipe - this is a keeper!